I have always wanted to work with dogs so I joined Jim’s Dog Wash in 2015. I am so lucky to have a job where I get to spend every day with dogs, they are my favourite kind of people! 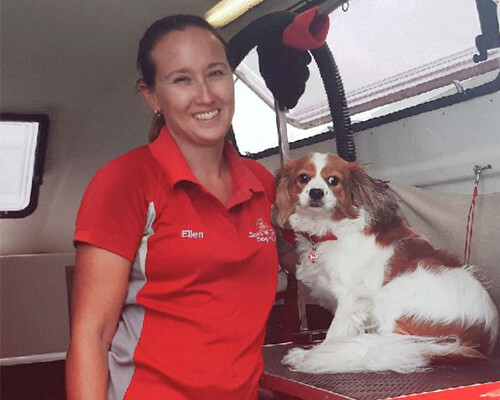 This is why it’s so easy to call on a dog grooming professional such as Ellen; a friendly face you and your dog can look forward to seeing regularly for a thorough wash, dry and trim. Our grooming trailers are non-threatening – and our main concern is that your pet feels safe and has an enjoyable experience. Our groomers are fully qualified, insured and guaranteed, and tailor their services to meet the particular needs of our pet. You can request a free no-obligation quote by giving Ellen at Jim’s Dog Wash Cleveland a call, and find out what we can do for you and your pet, today.